If you are in the Warsaw-Winona Lake, Ind., area this weekend, check out the BMH Books display at the Taste and Trade Expo at Grace College’s OCC on Wooster Road. Sponsored by the Warsaw/Kosciusko County Chamber of Commerce, the event showcases 80 local business and 11 restaurants or caterers. 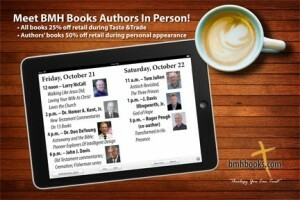 At the BMH booth, you’ll have opportunity to purchase BMH products at a 25 percent off retail. Seven BMH authors who make their homes in the Warsaw-Winona Lake area will be on hand to sign books, as well. Their books will be 50 percent off during their personal appearance. Today, Warsaw-area pastor Larry McCall kicked off the book signing at Noon. Also scheduled for today is Dr. Homer Kent at 2 p.m., Dr. Don DeYoung at 4 p.m., and Dr. John Davis at 6 p.m. 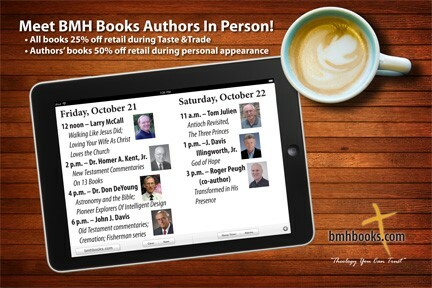 Tomorrow (October 22), Tom Julien will appear at 11 a.m., J. Davis Illingworth at 1 p.m., and Roger Peugh, at 3 p.m. The Expo is open today through 7 p.m., and tomorrow from 10 a.m. to 4 p.m. Admission is $3 and kids 12 and under are free.